In some indeterminate post-apocalyptic future, there are those few who have survived the wars and destruction and remain living, if it can indeed be called living, in what was once the southeastern United States. But now there are no more entities, no governments, only remnants. Remnants and a vast green desert. A desert comprised of vines a foliage but which has strangled out the lives of all other plants, most of which would not have survived the fallout anyway. But along with the cockroaches, the kudzu persists, an invasive species, without natural predator in this transplanted habitat and able to withstand of barrages of unnatural predators that have annihilated everything else. 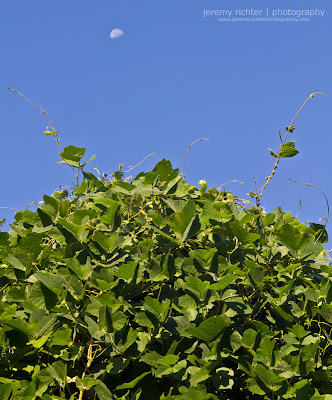 It persists, thrives, swallowing up forests, buildings, towns, the last vestiges of humanity, climbing, reaching ever higher, endeavoring even to ensnare the moon with its greedy, finger-like, green tendrils....Or at least, that's what I envision the future looking like, because this Kudzu is everywhere, covering more than seven million acres in the South and capable of growing up to a foot a day in the summer. And most herbicides are known to cause it to grow faster, and the singular one known to kill takes years to do so.